Mode Studios, the original video programming and branded entertainment division of Mode Media, today released their latest episodes of their viral sensation original series, "100 Years of Fashion," which has surpassed 276 million views for the first 7 episodes, making it the most watched fashion video series ever. Today, Mode Studios released the eighth episode, 100 Years of New Year’s Style, which takes viewers on a journey through men's festive fashion for the last evening celebration of the year, starting off with a beautiful tux with tails, and a top hat in 1915. Matt Watts, the model featured in 100 Years of Men's Fashion in 3 Minutes, and 100 Years of Men’s Swimwear, also stars in 100 Years of New Year’s Style. Watch the episode on Mode: https://www.youtube.com/watch?v=4Lvh2TeAErs. The eighth episode is presented by Ryan Seacrest Distinction (RSD), available exclusively at Macy’s. RSD, a smart, stylish and timeless collection of men’s tailored clothing and accessories, is featured throughout this 100 Years New Year’s Eve episode, but most notably, in the 2015 look. The 2015 look features a blue velvet tuxedo, black tuxedo pants with a satin waist. Mr. Seacrest’s signature New Year’s Eve countdown also serves as a venerable ending for the segment. Ryan Seacrest Distinction was founded in 2014 and has since become the most successful menswear launch at Macy’s in more than a decade. 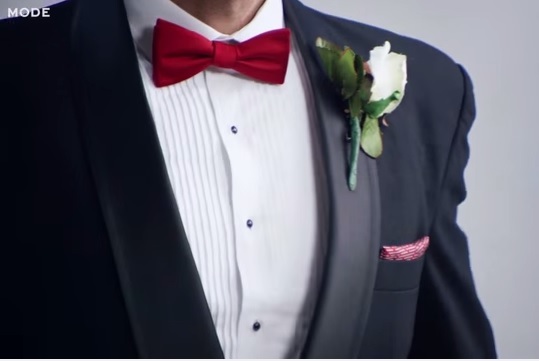 RSD tuxedos and smoking jackets are tailored, slim-cut and have a subtle throwback vibe to old Hollywood, along with a full range of accessories (shirts, bow ties, cufflinks and tie bars to have a many dapper and dazzling for New Year's Eve or any formal evening affair). Mode.com is an owned & operated social networking platform where creators can upload videos and build content stories. Content on Mode is curated by professional editors and distributed in user feeds—personalized by the Mode content algorithm technology. Since its launch in April, Mode has grown from zero to 38 million unique monthly users, and crossed over 1 billion streamed video views. Mode Media, a top 10 U.S. media property with 136 million unique users a month, was founded in Silicon Valley in 2004 with a simple, yet powerful idea—to help people discover relevant content by combining the power of human curation of premium content with technology that distributes the right content to the right people at the right time. Today, Mode Media is building the largest independent premium video and content platform for creators powered by distribution and streaming technology that delivers targeted native videos, content and branded entertainment at scale in real-time. If addition to history of fashion videos, you may want to do some reading. If that is the case, you may want to visit the holiday fashion book list we posted recently. You may also want to view the 100 Years of Wedding Fashion video. Better yet, you would probably enjoy the 100 Years of Lingerie video as well.